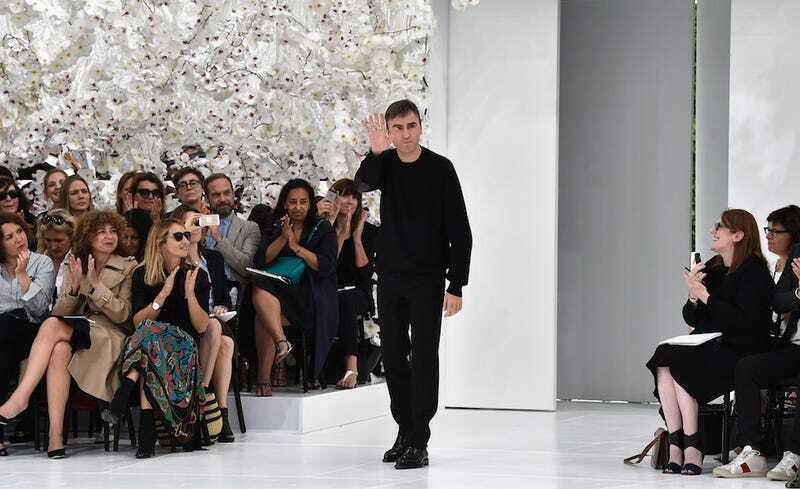 Raf Simons, the designer behind three and a half very successful years at Christian Dior, has suddenly announced he will be leaving the French design house. Simons took over at Dior following the 2011 ouster of John Galliano after his anti-Semitic rants. Popular and comparatively low-key, Simons, 47, presided over a 60% rise in sales in his relatively short time with the brand. “He gave Dior’s rich, romantic legacy — the full skirts, the fitted Bar jacket, the flowers — a modern edge, and without the drama and personal excess of his predecessor,” writes New York critic-at-large Cathy Horyn. Runway looks from the past few seasons at Dior. Although Simons seldom voiced regret in interviews about the workload at Dior — six shows a year, two involving the extra finesse of haute couture — he was candid about the pressures it put on the creative process. Simons was frustrated by the lack of time to create. For his debut show, in July 2012, he had eight weeks to prepare, but that was soon cut in half, given other demands on his schedule. Also this year, Alexander Wang left his post at Balenciaga, and Donna Karan stepped down at her namesake brand.